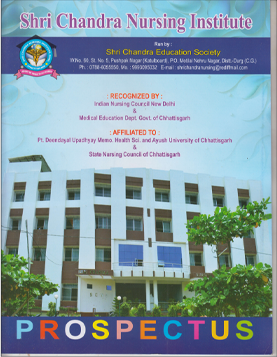 The Faculty of Shri Chandra Nursing College (Inst.) believes that the Bachelor in Nursing Prepares Nurses for position in Nursing both in the hospital and community at large. Our concept of nursing is based on the I.C.N.’s definition of “The unique function of the nurse which is to assist an individual, sick or well in performance of those activities, contributing to health or its recovery” It is also based on W.H.O.’s definition that “Health is a complete state of physical, mental and social well-being and not merely absence of diseases or infirmity”. The faculty of Shri Chandra Nursing College (Inst. ), Durg believes on providing Nursing education based and built on scientific principles in order to produce professionally qualified nurse who will be able to function as a team member in all health care agencies as role of practicing nurse either in Hospital or Community based organization. The graduates and post graduates with experience can rapidly move towards leading positions in Nursing education, administration and research.